Intricately weaved to emulate the look of fabric, the designs in Roberto Coin’s Appassionata Collection are truly unique. 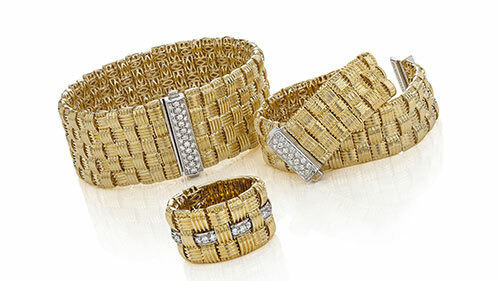 From the Italian word for ‘passion,’ the jewelry in this collection is effortlessly chic, The basket weaved Three Row Bracelet, available in either 18 karat rose or yellow gold, is the star attraction of any wrist. There is a hint of playfulness in the clasp, with sparkling diamonds set in 18 karat white gold, perfect for the daring to mix metals. The thick band of the Three Row Diamond Ring is truly a stunner, intricately combining gold weaved with micro-pave set diamonds.